Real Ale pub in the traditional style with large beer garden. Quiz and music nights. 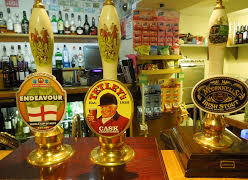 REAL YORKSHIRE ALES AND A REAL YORKSHIRE WELCOME! 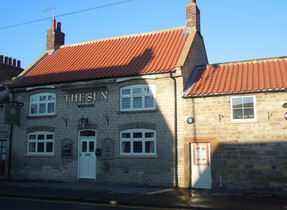 The Sun Inn is a free house specialising in real ales from small Yorkshire breweries and real ciders, served from the cellar. We have won Scarborough CAMRA’s Rural Pub of the Year for four successive years, and are in the Good Beer Guide. We have a cosy bar area with a real fire, and a new larger Garden Room which is available for events, and opens onto a large garden with a covered smoking area. Each month there is an art or photography exhibition in the Garden Room. We do not serve food, but customers are welcome to bring a picnic or fish and chips, and bread and cheese is served Friday teatime, raising funds for Yorkshire Air Ambulance. There is no TV but we have regular Quiz Nights and live music and customers often organise their own fund-raising events for their favourite charities. We have a barbecue available for customers’ use. In the summer we have Giant Garden Games available (eg Dominoes, Jenga and Draughts) and there are two Petanque (Boules) Courts for family fun in the garden. 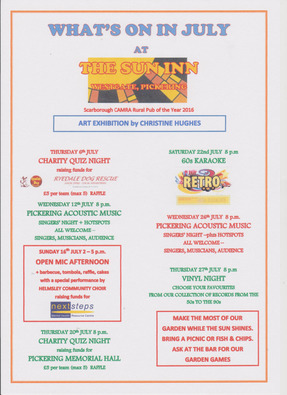 Our July Events are shown on the picture to the right.